Diterpenoid alkaloids with remarkable chemical properties and biological activities are frequently found in plants of the genera Aconitum, Delphinium, and Garrya. Accordingly, several diterpenoid alkaloid constituents of Aconitum and Delphinium plants as well as their derivatives exhibited cytotoxic activity against lung, prostate, nasopharyngeal, and vincristine-resistant nasopharyngeal cancer cell lines. Four new C19-diterpenoid alkaloids, 14-anisoyllasianine (1), 14-anisoyl-N-deethylaconine (2), N-deethylaljesaconitine A (3), and N-deethylnevadensine (4), together with 17 known C19- and C20-diterpenoid alkaloids, were isolated in a phytochemical investigation of rhizoma of Aconitum japonicum Thunb. subsp. subcuneatum (Nakai) Kadota. Their structures were elucidated by extensive spectroscopic methods including NMR (1D and 2D), IR, and MS (HRMS). 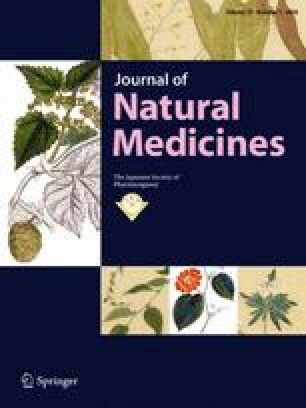 Eight known diterpenoid alkaloids, lipoaconitine, lipomesaconitine, aconine, nevadenine, talatisamine, nevadensine, ryosenamine, and dehydrolucidusculine, were isolated the first time from A. japonicum subsp. subcuneatum. Three of the new C19-diterpenoid alkaloids (1, 3, 4) and six of the known diterpenoid alkaloids were evaluated for cytotoxic activity against five human tumor cell lines.